Long Island City, NY. Fast, Efficient, and More Powerful: Today, mobility is extremely important. With the ECTACO iTRAVL 2 Galaxy Multi 31 language Voice Translator and Rugged World Travel Smartphone you can translate or study wherever you are; in the park, house, train, airport, walking, eating ... wherever. The iTRAVL 2 Galaxy is the world's most advanced and only professional voice translator, smartphone, and travel assistant. Years of development between Ectaco, Inc. and the US military yielded the SpechGuard, and it has now been molded into a civilian friendly multilingual version, model iTRAVL 2 /Galaxy Multi 31-Language unit. The iTRAVL 2 /Galaxy Multi 31-Langauge unit is able to translate using natural human voice tones. Offline and no need for an internet connection,speak any of the 31-languages freely with the iTRAVL 2/Galaxy! This is an exceptional phone and voice translator for exceptional situations. English -> Albanian, Albanian -> English; English -> Arabic, Arabic -> English; English -> Armenian, Armenian -> English; English -> Bosnian, Bosnian -> English; English -> Bulgarian, Bulgarian -> English; English -> Chinese, Chinese -> English; English -> Croatian, Croatian -> English; English -> Czech, Czech -> English; English -> French, French -> English; English -> German, German -> English; English -> Greek, Greek -> English; English -> Hebrew, Hebrew -> English; English -> Hungarian, Hungarian -> English; English -> Indonesian, Indonesian -> English; English -> Italian, Italian -> English; English -> Japanese, Japanese -> English; English -> Korean, Korean -> English; English -> Persian (Farsi), Persian (Farsi) -> English; English -> Polish, Polish -> English; English -> Portuguese, Portuguese -> English; English -> Romanian, Romanian -> English; English -> Russian, Russian -> English; English -> Serbian, Serbian -> English; English -> Slovak, Slovak -> English; English -> Spanish, Spanish -> English; English -> Tagalog (Filipino), Tagalog (Filipino) -> English; English -> Thai, Thai -> English; English -> Turkish, Turkish -> English; English -> Ukrainian, Ukrainian -> English; English -> Vietnamese, Vietnamese -> English. Representing a new generation of smartphones and travel technology, the Ectaco iTRAVL 2 is the most powerful & robust talking interpreter travel tool to simplify communication. 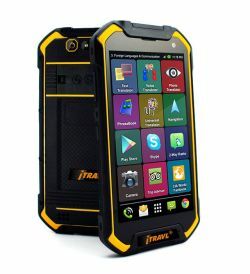 With its unique features, flexibility and great capacity for customization, the iTRAVL 2 is an indispensable gadget for anyone who encounters people with limited or no English speaking ability. Capable of receiving FREE incoming calls in over 160 countries without a contract and instantly translating voice and pictures in 31 different languages, the iTRAVL 2 will replace existing electronics frequently used by travelers including a smartphone, cell phone, laptop, radio and more. An instant voice translator, universal translator for 183 languages, 2 SIM card slots, microSD card slot, 5000 mAh battery (5 days with average usage), navigation & positioning system are just a few of its features. WI-FI, Bluetooth, and 4G Connectivity allow the device to access online resources, emails, SMS, and MMS. More importantly, you can use the iTRAVL 2 Galaxy for up to 5 days without needing to recharge. Boasting a brilliant color 5.5 inches IPS touch screen display with 1920 x 1080 pixels resolution in a sturdy, modern design, the iTRAVL 2 is Waterproof (IP67), Shock-Proof and Dust-Proof, the iTRAVL 2 is perfect for every world traveler. Contact Robert at 347-770-2047 for further information.